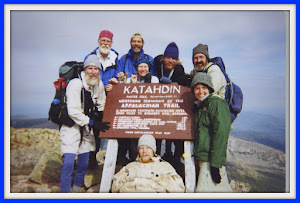 Walking 2,000 miles on the Appalachian Trail took me through and past many places. At least 36 small towns, countless mountain tops, lakes, rivers and valleys. Many, many different places. The odd thing about all these places is that on foot they become one place. Walking does not create gaps between places. There’s no “leave there, arrive here” sensation in walking. Instead, the space between here and there is filled with the places experienced on the way here. My thru-hike was the first such experience for me. My longest previous hikes did not really take me from one place to another. After 50 to 70 miles I was more or less in the same place I started. Even after hiking 170 miles of Vermont’s Long Trail in 1991, I was still in Vermont. The Appalachian Trail was different. I started walking in Georgia. I ended up in Maine. That’s one hell of a difference. All these places merge into a “single place” stretching along the Appalachian Mountains. Walking links them together without the separations that are so common with faster modes of travel. Just as Christians believe in the unity of the Holy Trinity in which separate spirits are also one, this thru-hiker believes in the mystery of many places/one place. I was in many places. I can measure the distance between any two. But because I walked from one to the other, they are part of the same place in my memory. No discontinuity here. Only the gentle progression of one step following another. The sense of place that comes from walking a long distance is unique in our modern society. We span great distances in a few hours. Rapid means of transportation make the world smaller in terms of access but they also fragment the world into many unconnected places, many more “there’s” that are linked only by the fact that one has traveled to them. The inherent links from one place to another are not part of the experience traveling 600 miles per hour in an airplane or at 75 miles per hour in an automobile. Only the gentle pace of non-motorized travel creates the experience of one place merging into another and, by extension, the interconnections among all those places. Crossing state lines further illustrates this experience. Until I hiked the Appalachian Trail I had never walked across a state line. I always drove or flew. Even when I lived right next to the Arizona-New Mexico line, I never walked across it. Walking across the Georgia-North Carolina border was a first for me. With one step, I linked two states. I did this 12 more times as I hiked. Each step across a state line connected to the steps that preceded it. My final step on Katahdin summit in Maine was a clear successor to my first step off Springer Mountain in Georgia. Katahdin and Springer were not here and there but rather a succession of “here’s”, two of the many places that together constitute a single place that I experienced as the Appalachian Trail. Walking at the speed of foot on the Appalachian Trail, I saw for the first time in my life the connections that join many different places into a single whole. Yes, indeed. These puppies arrived on my doorstep this very afternoon. The writing and publishing journey is complete, a journey far longer in duration than my actual hike. As was the case with the hike itself, writing and publishing brought new understanding and awareness. Now comes the next part of the journey--putting my work into the hands of readers. I hope you will find it interesting, informative and enjoyable. An author cannot ask for more.